I am ready for school to start. It’s been a long hot summer and I am tired. Tired of doing battle with a very stubborn 5 year old. Dan says she comes by it naturally and looks at me sideways in a knowing manner. Okay. Okay. But my greatest fantasy is to wake up, see Jessie’s smiling face, say good morning, and have her say good morning back. Instead, the first words out of her mouth, to me, are “NO!” It doesn’t’ really matter what I say, I just provoke this automatic response in her. She has also taken to stamping her foot, turning her back to me, and sticking her noise in the air in an attitude of “you can’t make me do anything!” I am exhausted with my very concentrated efforts at patience and consistency. And when I lose it . 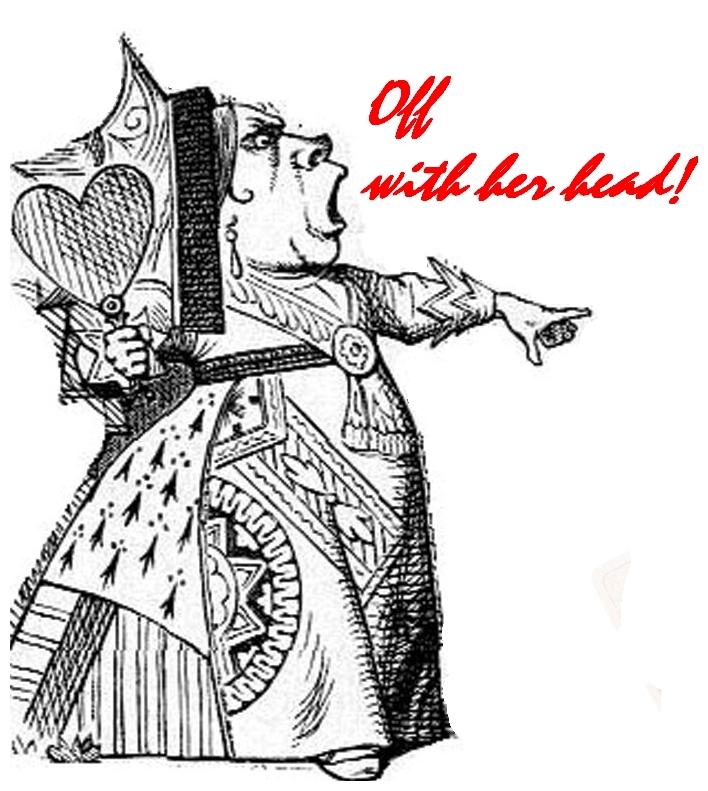 . . well, I know what the Queen of Hearts in Alice in Wonderland is based on. 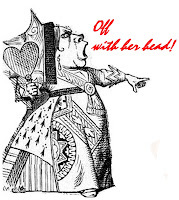 That overwhelming and irrational cry of “OFF WITH HER HEAD” is a very good likeness of me around dinnertime at the end of a long, hot summer day. I go to bed at night with parenting books trying to figure out my options. The most appealing is a long holiday by myself, which is just about as likely as winning the lottery. So I find solace in other mothers of five year old daughters. We remind ourselves that five is a difficult age as our daughters strive for independence and separation. We trade ideas on how to give them responsibility that they can manage without causing anyone bodily harm and brainstorm natural consequences. We all agree on one thing. When our daughters reach adolescence, we’re leaving home. My biggest battle with Jessie has to do with her sense of time, or lack of it. As a toddler, I didn’t expect her to fully grasp the concept. After all, wasn’t it her job to explore every diversion between home and playgroup or the park? The double acorn, the crooked front steps, the feel of grass as you lie looking up at the sky and can’t figure out why your mother is closing her eyes and counting to 10. Playgroup starts when you get there. Isn’t that the way the world works? Oh, if only it did. Any transition, any movement from one location to another could last as long as three or four hours if we went on Jessie’s schedule. And then she would miss so much—like school, playing at the park, and swimming lessons. Jessie loves swimming. This summer she took lessons every morning and finally mastered this breathing thing. Fearless as she is in the water, flailing and grinning with wide open eyes, it has taken her a long time to realize that you take a big breath before you put your head in the water. But when you finish swimming you have to get dressed and go home. Well, I guess you don’t have to, but hanging out in a locker room for a couple of hours every day is not my idea of fun. I guess I’m too driven, in too much of a rush to get on to the next thing. But I would like, just once, to be able to go from point A to point B without having to plan for each step in order to avoid a battle with Jessie over: getting out of the pool, getting into the locker room, not going in the whirlpool, getting in the shower, getting out of the shower, going to our locker without climbing inside very other locker (there are more than 100 of them), putting on each piece of clothing, and so on . . . One day I followed her lead and we got out of the locker room two and a half hours after her lesson. And while I’m willing to do this sometimes, there is no such thing as sometimes with Jessie. If you change the routine or don’t follow the well-mapped out plan and forget to be consistent you are right back where you started—prodding, reminding, ignoring, coercing, and on really bad days, yelling. Sometimes I feel like giving up, but I don’t because I want, so much, for her to be independent, to do the things that she can do by herself. And the look on her face, when she gets her bathing suit on by herself or gets the paints out, is worth every one of my own personal battles with frustration, anger, guilt, and exhaustion. This summer seems to have been extra hard on both of us, and when Dan comes home from work, I just want to go to bed with a good book and dissolve into somebody else’s world. But dinner is the time for us to be together as a family, share moments of our day and reconnect. It’s a time I would like us to savour and enjoy. It doesn’t always happen. We’re tired, it’s hot, Jessie wants to play trolls with Dan, and there’s Mom with this image in her head of the happy family around the dinner table. It’s Dan’s turn to do battle with Jessie about staying at the table until she is finished. I’ve given up. Dan and I close our eyes, weighting the consequences. We should say, “You can dance if you are finished your dinner,” we should be consistent, we should follow through. Instead, Dan turns up the volume. We sit and watch Jessie dance. She sways and moves her shoulders and turns and pirouettes. Her eyes are half closed as she listens to the rhythm of the jazz and is moved by it. Some of her awkwardness is transformed into a delightful quirkiness that is both cute and very serious. As I watch her dance in the fading summer light, I realize with a pang how much she has grown. She’s developed her own way of moving, of listening to the music that is this life around us. My only hope is that we’ve given her enough courage and comfort to always want to dance at dinner. The music stops. She bows and looks at us expectantly, defiantly, with pride. Waiting for us to clap. We do. Not because the dance is finished, but because it continues.